The Hero Honda Glamour PGM Fi !! 1) The PGM Fi System - The Programmed Fuel Injection or PGM Fi, is a collection of five sensors and an ECU. The five sensors play their part in analyzing five different operating conditions such as the air entering the engine manifold, the temperature of the engine oil, the temperature of the air intake, Throttle position and angle of the Crankshaft. This data is provided to the ECU, which then determines the idle combination of air-fuel ratio at that given condition. Quite impressive eh!! 2) RTMI - The Real Time Mileage Indicator (RTMI) was another revolutionary inclusion in the Glamour Fi. It continuously provided the rider the mileage over the last 10 seconds based on the fuel consumed and the distance travelled, so that rider can adjust his riding habits according to his fuel economy needs. 3) The bike sported the second digital console after Karizma, providing a fuel gauge, RMI etc. 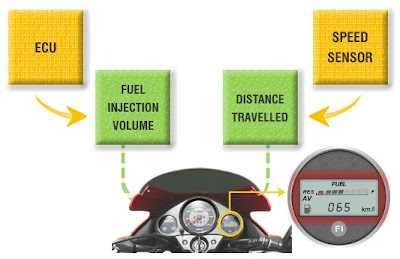 1) Bank Angle Sensor - which would shut the bike and the fuel supply if the bike topples off. 2) Malfunction Indicator - would flash if any of the five sensors of the PGM-Fi system malfunctions. As for the aesthetics of the bike ...... I never liked the looks of it, even though Hero Honda kept screaming of it's so called "Magnetic Styling"!!!! What I think is that the bike lost the race primarily because of two reasons. Firstly, the Indian market though very competitive, but is very economy oriented. When I say economy I'm not meaning the Fuel Economy the bike offers, but I meaning the load the bike gives to the buyer's pocket. The ex-showroom price of the bike in Delhi is arround Rs. 55900. An average commuter won't look at the wonder technological features this bike provides. He would instead get the price-list of the two or three other 125cc bikes and rule this gem out. For example, if we consider it's closest 3 rivals - Honda Shine, Bajaj XCD and Yamaha Gladiator Type SS/RS, then price wise, Glamour Fi is fighting an already lost battle. 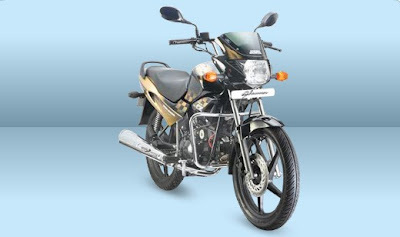 I haven't compared the price of Bajaj Discover 125 because it has been discontinued as of today. Infact Bajaj Discover 135 comes with an on-road price tag of around 45000 in Delhi. Secondly, why would you like to introduce Fuel Injection in a 125 cc bike, but still keeping the other engine specs the same (124.8cc engine, producing 9bhp @ 7000 rpm). On the other had Karizma finds itself left out like the prodigal son and is still waiting features which Glamour Fi has. I would say it's a sheer lack of foresightedness from Hero Honda guys and Uncle Mujal got this completely wrong. But again, even if Glamour Fi was launched, it was not backed up by proper marketing strategies (except for the initial ho-hum that was created). After seeing the initial market response, the bike was left on it's dying fate, and the aftermath is, till today I haven't seen any Glamour Fi on road here in Gurgaon. Finally all I would say is that though Hero Honda started the era of motorcycles here in India, but the way it's behaving off-late is very disheartening. I don't what the company is trying to prove by only limiting itself to body and sticker jobs and purposely killing good bikes (began with the Hero Honda Sleek and the latest being the Glamour Fi). Yeah.. the Glamour PGMFi lost the plot due to the High Price tag.. 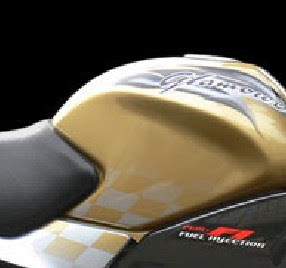 The Karizma doesn't have "Fi" on it since Honda hasn't yet introduced "Fi" on the engine on which the Karizma is based. The 125 cc Glamour got the "Fi" since Honda already had the technology in place for its 125 cc step thrus meant for S.E Asian markets (which have the same enigine).. Hero Honda can't help it as it's R&D is limited at designing "Fresh" & "New" Stickers and has to depend on Honda for new tech. Really, I fail to understand what is stopping Hero Honda from getting the simple fact that they should quickly start thinking rationally to stay in the race!!! I am in confusion of buying this bike or the Stunner carb version. I expect mileage should be atleast Rs.1 per km in all circumstances. Style is also one requirement. Pls suggest me a bike of 125 cc, good mileage and stylish above super splendor . I m a short heighted person of 160 cm(5'2").